Even though it's barely spring here in Kansas, I already know that this dish is going to be one of our go to meals for the summer. I just love the way all the flavors come together and it is a light, yet filling, dinner. Next time you want a taste of summer, try this! Heat grill. Fold four 18-inch-long pieces of foil in half; unfold and coat inside with cooking spray. Place 2 cups spinach in center of 1 half of each piece of foil. Combine couscous with 1/4 cup water; divide evenly among packets, placing on top of spinach. Combine shrimp, 1/4 cup cilantro, oil and 1/2 tsp salt in a bowl. 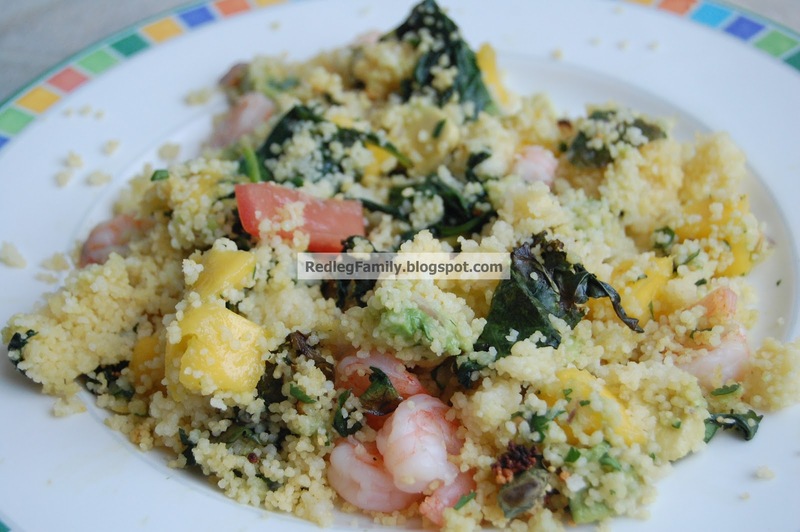 Divide shrimp evenly among packets, placing next to couscous. Fold foil to close and crimp edges to seal; place on grill; close lid; cook until packets are fully puffed, 10 minutes. Combine remaining 1/4 cup cilantro with remaining 1/4 tsp salt, mango, avocado, tomato, onion, and lime juice in a bowl. Carefully cut foil to open; stir contents; garnish with salsa before serving.